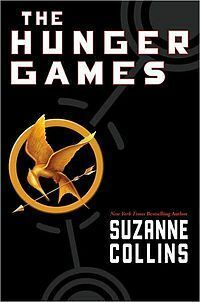 I can finally say that I have left my rock and joined the “in-crowd.” I finally read The Hunger Games. It’s true that these books have been sitting on my shelves gathering dust for at least a year, maybe longer. I have no excuse to offer for why I haven’t read these books until now. I knew they were great (I’ve heard it constantly). I’ve been threatened by my friends to read the books “or else”—but they always seems to forgive me. =) But, alas, I can finally say I have read them… and boy am I glad I did! First, the characters. I loved how different Peeta and Katniss were. You truly get the sense that Peeta is a genuine “nice guy” that you can’t help but like. He doesn’t seem weak or annoying. In fact, he warms my heart and made me smile. Katniss, on the other hand, is a little rough around the edges. She’s not unlikeable by any means. I really liked her. I am a sucker for books with strong female characters! (Not the typical whiny, boy crazy, hormonal nightmares that you normally read about.) The relationship between Prim and Katniss captivated me. For someone to volunteer for such horror to protect another… wow. Oh, and then there was Haymitch. Heh. He was grouchy, ornery, and an absolute riot. Maybe I wasn’t supposed to like him as much as I did, but I couldn’t help it. I don’t think there is much to say about this book since just about everyone I know has read it already. I can only offer my insights into the book that has been given so much hype. I was fascinated by the games. Since there are three books, I already knew how the games would eventually end. That wasn’t a surprise, which I think took away from my experience. Somehow knowing that the two main characters survive took part of the thrill away. Of course, there were a few surprising twists to keep it interesting until the end. I think it’s safe to say I am pleased that I finally read this book. Did it get a 5 star rating from me? No, and that’s probably because I knew too much about the book going in. This is a solid 4 (maybe a 4.5? ), however. I devoured it in a day and instantly started on the second book. I can’t wait to see the movie now and see how the unique characters and settings are brought to life.